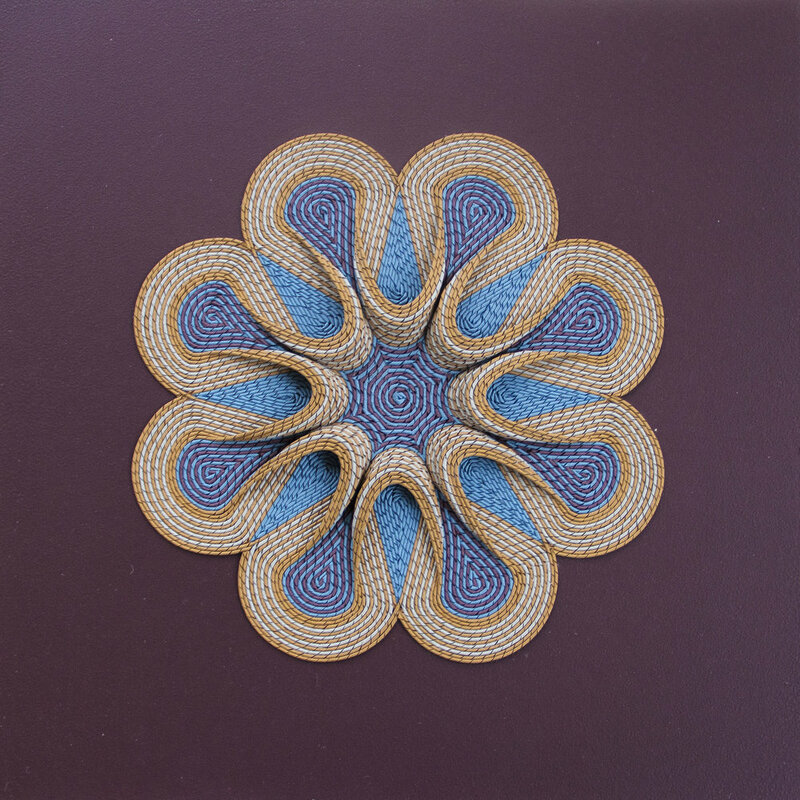 Aylawadi has been a part of several group exhibitions and art events like the Paper Art Biennale in Netherlands 2015 and Sydney Contemporary 2015. She has been a finalist for several prestigious art awards and been highly commended for her work at the Woollahara Small Sculpture Prize 2014 and the Alice Springs Art Prize 2014. ““Tour de force” by an artist “with a passion for the qualities of paper”, very successfully drawing on historical imagery and refiguring it, a difficult challenge. 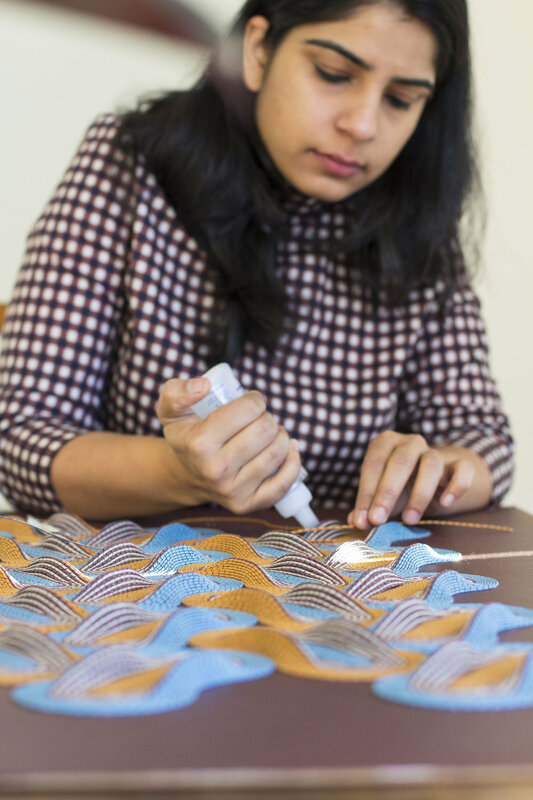 “In the last year, my slow meditative paper weaving practice has evolved from two-dimensional paper tapestries to three-dimensional geometric sculptures. In this show, I have attempted to create a body of work exploring the idea of prayer and carving out a place for personal meditative contemplation. Inspired by the geometry, architecture and arabesque patterns in temples/churches/mosques that I grew up around, these works are an invitation to viewers to pause, observe, contemplate and rest. How do you plan and design the forms you create? My designs happen either as geometric abstractions of organic forms in nature or with constraints I create. For example some of my recent work is inspired by a trip to Chile, where I saw a local drink - Yerba Mate - that is consumed in cups made of hollowed out gourd. The organic shape of the gourd provided inspiration for a geometric form that I used in various combinations in the pieces titled “Gathering” and “Ceremony”. The tea drinking is a ritual in Chile that brings people together and that felt like a perfect fit for the works I was making. Rituals and ceremonies were an essential part of the my experiences of going to places of worship and what made them places for prayer in turn. Other times my forms happen because of rules I make. For e.g. : forms made with four or six circles and their interactions with each other in a 3D space. The use of repetition is important to me - as it forces me to slow down and experience the flow of making. Thinking about repeating geometric patterns and looking for them in everything I see sometimes leads to surprising results. Can you tell us more about the colour combinations for this show? I used only four colours in various combinations throughout all the works for this show. Blue for water, yellow for the sun/light, clay for air and brown for earth. Being someone who doesn’t think of herself as a religious person, I needed to think about why prayer is important to me. I do not believe in the stories religions tell us but I do believe in nature as a gift I’m thankful for. And these colours felt like the right way to think about the divine and to create an alternate place for contemplation and prayer. What would be your dream art project/commission/job? Making this show for Koskela’s beautiful walls was one of my dreams! I think a large scale, quiet work, in a public space in the Silicon valley is my next one. Having studied to be a computer science engineer, I found joy in going back to the table and making something slowly with my own hands. To make a piece that sits confidently in a place that works hard to make everything faster and more efficient would be nice. I say this with the knowledge that everything I’m doing today are things I had never imagined for myself - they happened because my mind was open to play and just being creative for the sake of it. My dream art project is to feel curious and creative always, leading to possibilities that I can’t imagine today. Making and the opportunity that it gives me to be the person I’m not, even for a short while. I’m impatient in every aspect of my life but my work as an artist forces me to slow down and respect my materials & time by doing things properly. I am a patient person with my art. Getting acquainted to the possibilities and true creative process through this work gives me immense joy.